Did you know, that Energy Efficient interventions can bring significant reductions in energy bills: 10 – 20% on bills and resources, and more advanced projects, like solar-powered street lights, save 100%! How to reconstruct heating system of local kindergartens with biomass boilers, or install solar pannels for street lightning, or reconstruct water supply system using innovative energy saving technologies today representatives of seven regions shared their practical experience during the Interregional Energy Efficiency Conference in Sumy. Kirovograd, Ternopil, Mykolaiv, Khmelnytsk, Kherson, Sumy and Cherkasy onblasts presented their results and experience in the energy efficiency area in terms of decentralization reform. «This experience is very important for 18 Amalgamated Territorial Communities of Sumy region, who care a lot about their wellbeing and want to improve the quality of services on local level. 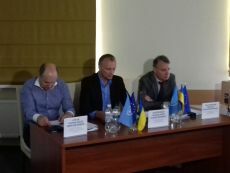 In my oppinion, the fact that this conference is taking place here in Sumy region, it means that we reached realky good results in this area», underlined Okeksandr Marchenko, First Deputy Head of Sume State Administration, in his wellcoming speach. 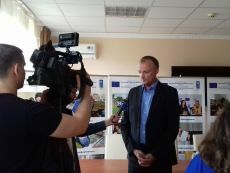 In total, only over the Third Phase, the joint EU/UNDP "Community Based Approach to Local Development" project supported more than 200 innovative energy efficient solutions and more than 470 energy saving initiatives in rural area.